What began as a challenge to entertain his daughter has taken Michael J. Sullivan on an unusual but productive publishing career, through self-publishing and promotion on to publication with Orbit books. 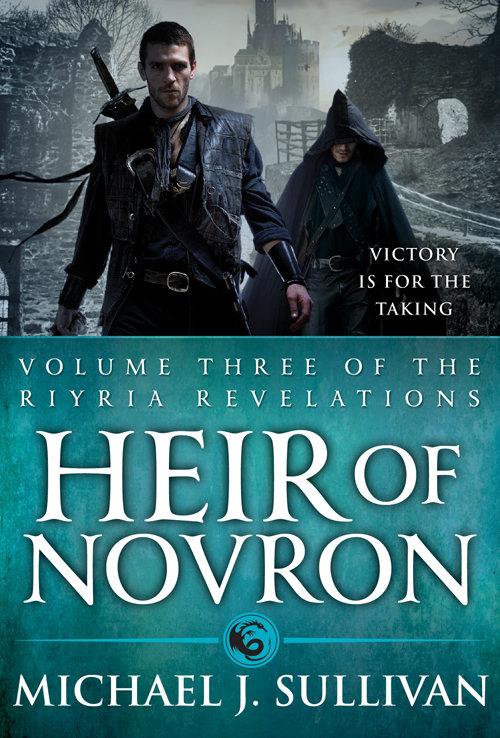 The Riyria Revelations at first seems a familiar fantasy series, with predictable tropes, but it’s how Sullivan uses them, and its strong, unique and interesting characters, that make this series one well worth reading. Theft of Swords collects the first two volumes of the six-book series in a nice, weighty quality paperback. In The Crown Conspiracy our main characters are nothing but low-life thieves: Royce Melborn and Hadrian Blackwater, although they’re very good at their jobs. The story begins with the introduction of these intrepid characters and their next heist to steal a particular item within the impenetrable confines of the king’s castle. But as soon as they have their hands on the item, the trap is sprung, and they find themselves part of an elaborate plot. At their feet lies the lifeless body of the king. 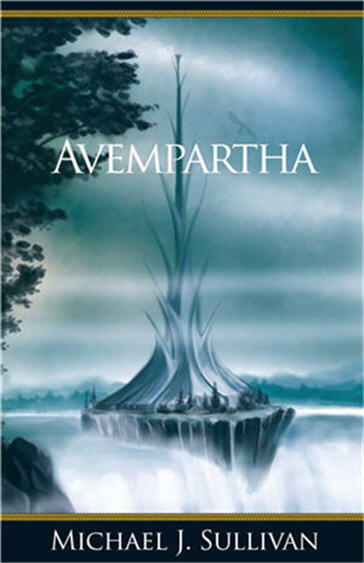 In Avempartha, our intrepid duo returns in the second installment of The Riyria Revelations to solve another mystery and fight another day. Before Royce and Hadrian barely have time to settle after the fun had in The Crown Conspiracy, they find themselves pulled into a new problem: a young woman needs their help as her village is being attacked by an unknown nocturnal creature. Sullivan ramps up the action and story, as we learn more about the characters we’ve come to like, as well about the incredible world he has created. At the same time more details are revealed about the growing overall story, leaving readers waiting in earnest for the next installment. This edition also features Sullivan’s original maps and a helpful character and important persons/gods list in the front. 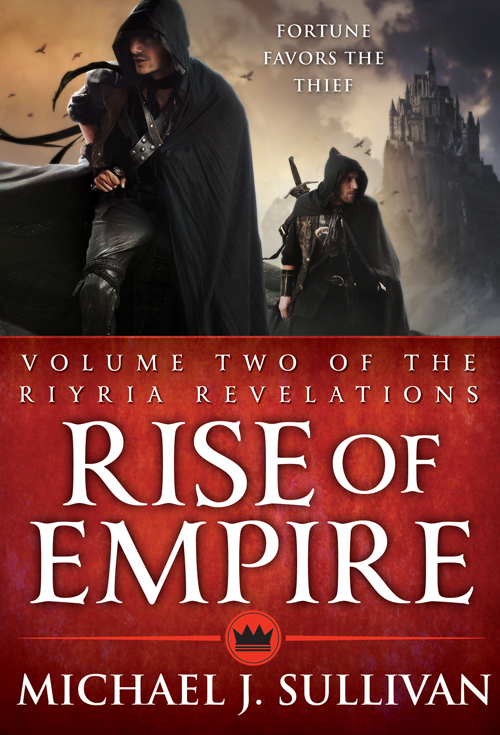 In the back is a detailed glossary, an in-depth interview with the author, and a teaser for the next volume, Rise of Empire, consisting of the third and fourth volumes of the series, due out in December. 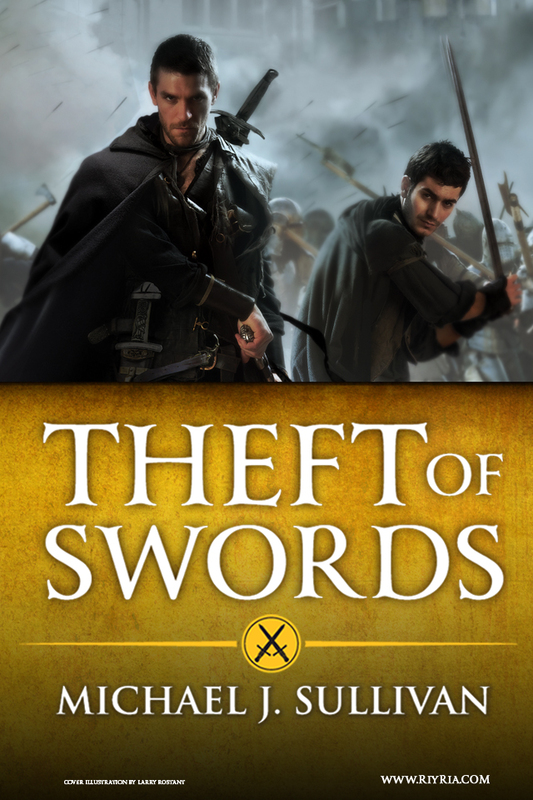 To purchase a copy of Theft of Swords from Amazon, and help support BookBanter, click HERE. Jim Butcher returns – a little behind schedule – with his thirteenth Dresden Files book, which was pushed back a couple of months as Butcher explains in his introduction because he needed that extra bit of time to make Ghost Story perfect. We last left Harry Dresden shot and sinking beneath the waters, left for dead in Changes; between then and now a short story collection was published, revealing some great adventures, as well as some very interesting and important story- and plotlines that hadn’t been discussed in the regular novels. Now fans finally get to find out what exactly happened to Harry . . . if you don’t want to get spoiled, stop reading. And Harry is pretty much . . . dead, but then that doesn’t really stop Dresden. He finds himself initially in a sort of between world which is a different form of Chicago, and gets some help from none other than Murphy’s dad, and before he knows it, he’s back in regular Chicago, only he’s a ghost and can’t be his regular old self. Harry has to think and work differently now, and employs the help of an old friend, the ectomancer Mort, to get by and help him find out just who exactly executed him, as well as to protect his friends. Unsurprisingly, Harry gets into more problems and fires than he can handle, real fast, but to use magic in his incorporeal state he must use the power of memory. Butcher uses a great ploy here to give some great back story and history on Harry and his life that readers have been curious about for many books, to make his magic that more powerful. Harry doesn’t get to be his usual self as a ghost, so he needs to think about what he does, and be creative about it. Ghost Story is a more mature Harry that has been overdue, as he must now face his reality for what it is without any pretension. This thirteenth book represents Harry Dresden at his very best, as he must now begin a new chapter in his life, and this definitely shows in Butcher’s writing and storytelling, setting up for a great next book and a whole new world for Harry Dresden, wizard at large. Originally written on August 15, 2011 ©Alex C. Telander. Six years in the making; over a thousand pages in length: while A Dance with Dragons has gone on to become an instant super bestseller (as well as the hardcover outselling the eBook edition), sadly the best thing about this book is really that fantastically mesmerizing cover. This mighty tome falls more in line with its less well received and not so well reviewed predecessor, A Feast for Crows, than with the groundbreaking first three books of A Song of Ice and Fire. It seems that time may not be the best thing for George R. R. Martin when it comes to writing his epic series, as he seems to enjoy spending more time describing scenery, and food, and anything gruesome or unpleasant than moving the story along. He goes on tangents, taking trips with new characters that appear to have little bearing on the main plot; or spends literally hundreds of pages with characters readers have come to know so well and love . . . and nothing bloody happens! Martin is becoming what can only really be truthfully described as Jordanian; no he’s not immigrating to Jordan, but writing in the style of the man who became the true master of the “massive mass market,” Robert Jordan. In the North, around the Wall, King Stannis Baratheon seems to spend a lot of time trying to decide what to do with no real power or army to use, while listening to Lady Melisandre, who continues to spout enigmatic prophecies that make little sense; yet readers do get to enjoy a chapter from her viewpoint for the first time. Meanwhile, Jon Snow is elected as the 998th Lord Commander of the Night’s Watch, as he must deal with not just enemies beyond the Wall, but also amongst the very men he leads and is in charge of. He works with the wildlings, bringing them south of the wall to bolster his forces in preparation for a possible attack from the Others; it seems to be an interesting act of diplomacy, but goes on for far too many pages, with little action or continuing story taking place. Much of the rest of the book takes place to the far east. Martin has provided a couple of new maps, but nothing so clearly defined and comprehendible as the great continent of Westeros. Tyrion flees to Pentos, drowning himself in wine. He is forced to join with a group traveling to Meereen, along with the apparently not so dead prince Aegon Targaryen. Tyrion – as he always does – manages to get involved in a whole variety of adventures, including the meeting of another dwarf, and a female no less! Daenerys is the character that seems most put through the ringer in this book; much like Cercei was in A Feast for Crows. She is no longer the tough, proud, defiant woman that everyone feared, and not just because she has three growing dragons. Having conquered Meereen, she should be the unstoppable, unquestionable queen that she is, and yet insurrection is afoot and Daenerys cannot seem to decide what to do; perhaps it is because she has become obsessed and besotted with one of her soldiers and seems to be able to think of little else when he is nearby, and yet he is of lower class and cannot possibly be her husband. The black dragon, Drogon, meanwhile is running rampant through the countryside as growing “teenage” dragons do, and Daenerys has no idea how to control him. Finally there is Quentyn Martell, Prince of Dorne, whose story comes from nowhere as we follow his trek across the lands to Meereen, where he hopes to woo Daenerys by enslaving one of her dragons. It does not end well for him. Interspersed throughout the lengthy book are other POV chapters from the likes of Bran Stark, Davos Seaworth, Reek (who is in fact the very not dead Theon Greyjoy), Arya Stark, Victarion Greyjoy, as well as some surprise cameos from Jaime and Cercei Lannister. These appearances may not have be so incomprehensible if their storylines were allowed to go somewhere, and yet many of them barely get one chapter, leaving the reader wondering why they were ever added to this book in the first place. What was the point? Especially when many hundreds of pages are spent on other main characters, with very little happening with them, other than plenty of description of what they’re wearing, what they’re eating, and what the scenery looks like. Pure Jordanian! At a recent signing, George R. R. Martin briefly brought up one of his most tumultuous periods in the six-year writing saga of A Dance with Dragons, saying that in a year or two who would discuss it in greater detail once everyone had read the book, but confessing that he had sacrificed at least a year at what he refers to as his “Meereenese Knot,” in trying to decide how events were to transpire and what characters and POVs were to be involved, featuring rewrite after rewrite after rewrite. It seems Martin may have in fact written himself into a deep, dark pit of despair that he hasn’t really been able to write himself out of. Perhaps he should’ve scrapped everything and started again? After sacrificing over a half a decade of his life and the reader’s impatient waiting, he couldn’t exactly do that. Instead, the result is a book that is too long, has too little going on, and falls behind A Feast for Crows in that it is that much longer with less important story happening. There may be a number of readers under the same delusion suffered by those who professed the excellence and genius of the Star Wars prequels, starting with A Phantom Menace; but over time have come to realize the error of their ways and the true reality of the situation. A Dance with Dragons just simply isn’t that good of a book, but does serve to further the story somewhat, and fill in the details with many words and many pages and little action. 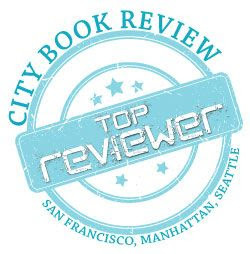 At the end readers will certainly be left unsatisfied, as they ponder on the possibilities of the penultimate book in the seven-book series (assuming it will stay at this number) with The Winds of Winter, where winter will supposedly have finally arrived. The question remains: if winter is finally here, how long will it be before readers actually get to read about it? Originally written on August 9, 2011 ©Alex C. Telander. CLICK HERE to purchase the book from Bookshop Santa Cruz and help support BookBanter! In the first book of the Heart of the Sisters series, A. Christopher Drown sets the stage for your ordinary fantasy novel with an apprentice magician – Niel – while traveling, finds himself caught up in a quest with an unusual group of people who think he’s much greater and stronger than he appears to be, but Niel soon learns that he has more of a role to play in this world. There are two facets that separate A Mage of None Magic from an ordinary fantasy novel that would be easily forgotten. One is that Drown does a good job of not just world-building, but also creating a mythology that echoes the Greeks and Romans that ties in with how this world was created, but also with how this mythology is still alive today and believed by many. The other is voice; Drown has a great, entertaining, and interesting voice in this book that will keep the reader reading and wanting more.